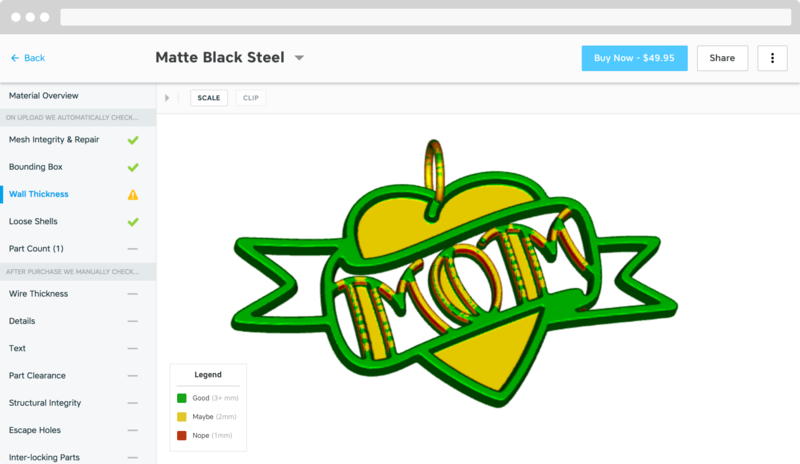 Shapeways is the world's leading on-demand 3D printing service and marketplace. I was lucky enough to lead design efforts for Creator and 3D Tools beginning in 2014, and continuing until late 2016. The goal of this case study is to give insight into my contributions as the sole designer, my overall design process, and what I learned from the experience. It was a long and messy process, with roughly 12-14 months of iteration and major releases. The team changed PMs and a few engineers midway through, and overall was an intense learning experience in working on complex software problems. Rejected orders at Shapeways are defined as the following: orders that cannot be fulfilled to the end customer as ordered, due to unforseen issues with manufacturing or distribution. There were lots of reasons rejections happened, but most commonly it was the result of 3D model files being designed to specs that couldn't actually be 3D printed or survive post-production and shipping. As it turns out, the process of 3D printing products on-demand in 50+ materials on a global scale is incredibly complex and prone to error. Most of the products are being produced for the first time ever, on untested and new production methods like 3D printing. The workforce, internal processes, best practices and the like were all being created on the fly by the Shapeways team. So it's easy to imagine just how much trial and error had to go into creating this service. ...the process of 3D-printing unique products on-demand in 50+ materials... is prone to error. To further exacerbate the production process issues themselves, Shapeways product provides access to new technologies for designers who have never previously had the opportunity to work with them. This is THE value to the world, but the issue that arose is that a great number of designs ordered weren't properly designed to survive the production or post-production processes for each of the 50+ materials - mainly due to designer inexperience or lack of education. To sum it all up, each rejected order was a disaster for both the customer and for Shapeways as a business. Typically, each failed 3D print would be re-printed serveral times, depending on a 3D printing engineer's discretion or best judgement. So this meant a rejected order would A) lose money and time for Shapeways AND the customer, and also B) break customer trust with the service, leading to low customer loyalty and confidence in the brand. This was set by Shapeways executive management Q1 2014, and rejections were deemed the #1 focus for most teams in the org. Being on the Creator Tools team meant that we had a responsibility to help solve this problem by providing better tools for our 3D designers - in the hopes that we could help them design better products for the 3D printing process. Secondary goals included improving the experience designers had when they did unfortunately experience a rejection, so that each time it felt more like a learning experience than a defeat. Also, we set goals to help unify customer-facing and internal tools and documentation in an effort to improve data consistency and provide a better experience for the customers. Our team concluded that the earlier in a designer's process they could identify flaws or issues in their designs, the earlier they could be corrected. The goal here was to save people time, through reducing the amount of time they spent reworking issues in the geometry. With that simple strategy set - which was developed in a collaborative way, led by our Product Manager - we could start brainstorming potential solutions. But first, we needed to understand the problem space, and have a holistic viewpoint of the issues behind rejections, and perhaps most importantly, how they affected people. Research: what caused rejections and how might we stop them? When starting to tackle a problem space as vague and complex as rejected orders, we needed to leverage customer research, data, and insights to help us understand a few things. Perhaps most importantly, where to start. Secondly, we needed a vision and plan for the long-term of the Creator platform. 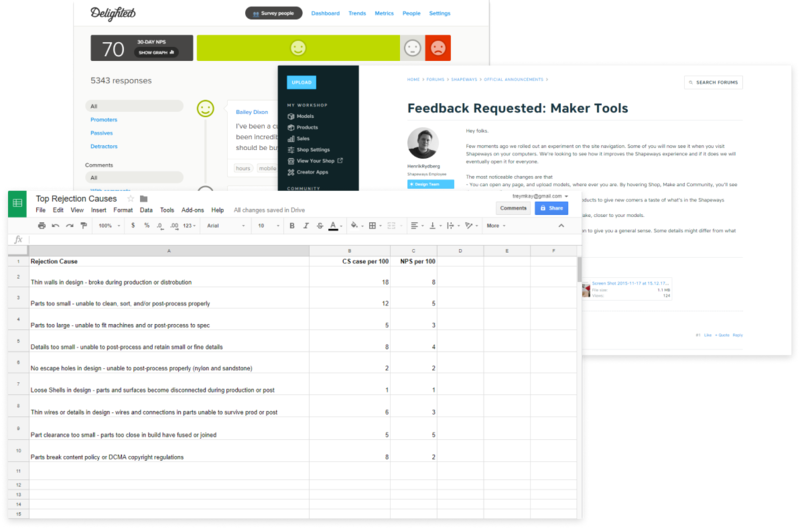 At Shapeways, research was a collaborative effort between UX, Product Management, Marketing, and Community Management teams. In this case, much of this research was led by our Marketing and Sales teams, who had brought in some outside help to diagnose these issues. As a designer, it was my responsibility to distill research down to the human problems. I needed to be the voice of the customer, and as such, I needed to understand their emotions, their pain points, their backgrounds and their goals. What are the leading causes of rejected orders? When in the process do they most often occur? What information do designers need to design more printable parts? How and when are designers made aware of the possibility of rejections? Can their expectations be better set before it happens? How can Shapeways better fit into the 3D design process to provide relevant material guidelines and information for customers? Some of the things we did to gain answers to these questions included working with the Customer Service team to flag incoming cases relating to rejected orders, tagging them in Zendesk, and then aggregating them on a weekly basis. We tracked common issues and counted how often they occurred. We also took to the community forums for conversations and threads about rejections, used NPS surveys, and in-person feedback sessions to hear from customers directly about the issues as well. We used data from CS reports, NPS surveys, and analytics paired with qualitative feedback in surveys and forums to understand the problems. What we really learned from the research and in talking with designers was that they simply weren't sure *how* to design for the materials these products were being produced in. Those designers coming from Industrial Design or Architecture backgrounds understood the concept of designing for the tolerances of a given material and production process, but those ten's and thousands of designers coming from animation, 2d, or other backgrounds had little-to-no idea about this. Shapeways had preliminary documentation about such tolerances, but initially the platform certainly didn't do enough to surface them early in the process for designers. We needed to fix that. Additionally, Shapeways needed to be clear and consistent with material information. We needed to provide specific measurements for suggested tolarances in every material, in all the criteria that might be helpful. Many designers were having to pay for prints to test the success of their work, which was costly and often yielded little to learn from. Over the course of 12-14 months, the team shipped many tools for designers, the most notable portion of the work combining into what is known as “3D Tools.” These tools were 6 printability checks that run on every single uploaded 3D file. Their purpose is to provide insight for designers on every part they upload on whether or not the part can be successfully printed or not. 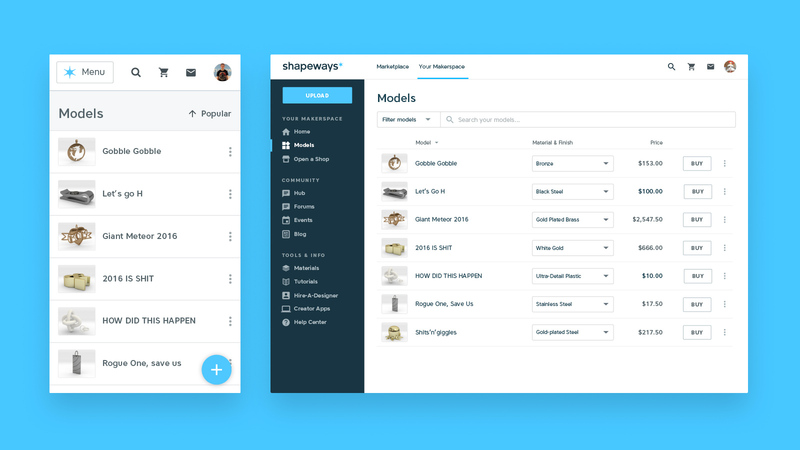 In addition to 3D Tools, our team iterated on several core flows and tools under Shapeways' maker UX roof. These included adding an automatic 3D model scaling tool, improvements to file versioning and history, a comprehensive material guideline database and subsequent customer-facing pages to display them, and other features that generally made this process easier to manage.